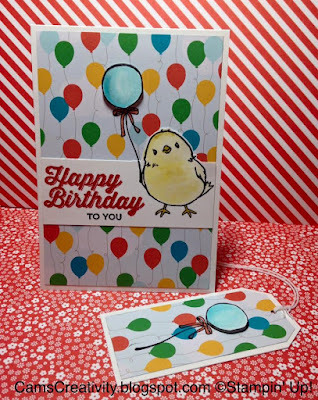 With Sale-a-Bration in full swing, today I'd like to share with you a card and gift tag combo, made using one of the Sale-a-Bration stamp sets. You could choose the Honeycomb Happiness as your free gift for spending £45 on anything Stampin' Up! 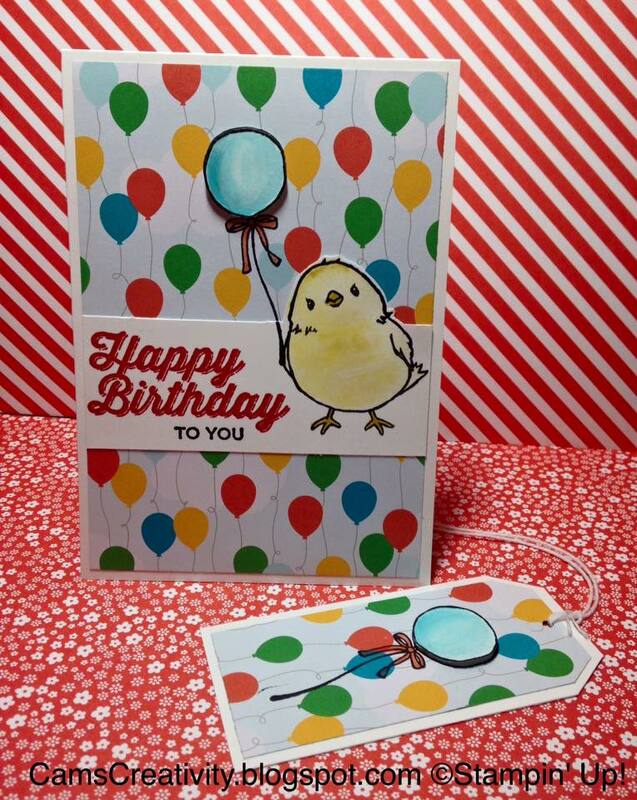 This chirpy little guy was stamped in Basic Black Archival Stampin' Pad, then coloured in using the Hello Honey Classic Stampin' Pad and an Aqua Brush. The balloon was much the same, only stamped twice, the first into the background paper, then a second into some Whisper White card. The balloon was then cut out and attached on top of the other balloon with Stampin' Dimensionals 3D foam pads. Labels: Angled Tag Topper Punch, Aqua Pen, Cam's Creativity, Cherry On Top, Designer Series Paper, DSP, Honeycomb Happiness, Perfect Pairings, Sale-a-Bration, Stampin' Dimensionals, Stampin' Up!